Now Cheltenham is not just for the horse racers, Art and History enthusiasts or the hippies and festival goers, even the simplest tourist who’s just here to see sights and eat will surely enjoy their stay at The Promenade Apartments – with Cheltenham being popularly known for having a wide range of gastronomic delights, any tourist would enjoy just kicking back and enjoying the cuisine that Cheltenham has to offer. 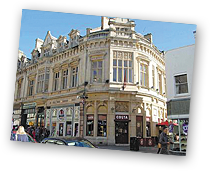 Cheltenham offers several al fresco dining restaurants and allows tourists to sample different cuisines and atmospheres, from the cafes on the promenade to the high end fine dining restaurants and bistros of Montpellier. Because of its gastronomic delights, Cheltenham has appeared in the pages of the Conde Nast Traveller, The Good Food Guide and even The Guardian. Various family restaurants pop up on every street, utilizing only the freshest local produce and ingredients. Besides those mentioned above, there are also several budget restaurants that would be perfect for any backpacker or vacationing family on a budget. Cuisines available can range from Local, Indian, Chinese, Italian, Pasta and Pizza, Thai and even Japanese. With literally dozens of food and drinks festival being held in Cheltenham every year, it’s no surprise that Cheltenham literally has hundreds of restaurants of all kinds, cuisines and beers available for any tourist any time of the year. Furthermore, there are various Cheltenham Foodie Tours held every Saturday all throughout the year that involves visits to various wineries, restaurants and fine dining places that would simply be a food lover’s dream! Make sure to book your tickets and reserve your rooms in advance especially if you’re planning on going during the food and drinks festivals as rooms and accommodations near the venue are easily fully booked. Why don’t you try The Promenade Apartments today? Call us and talk to our experts into reserving your room in time for your visit!